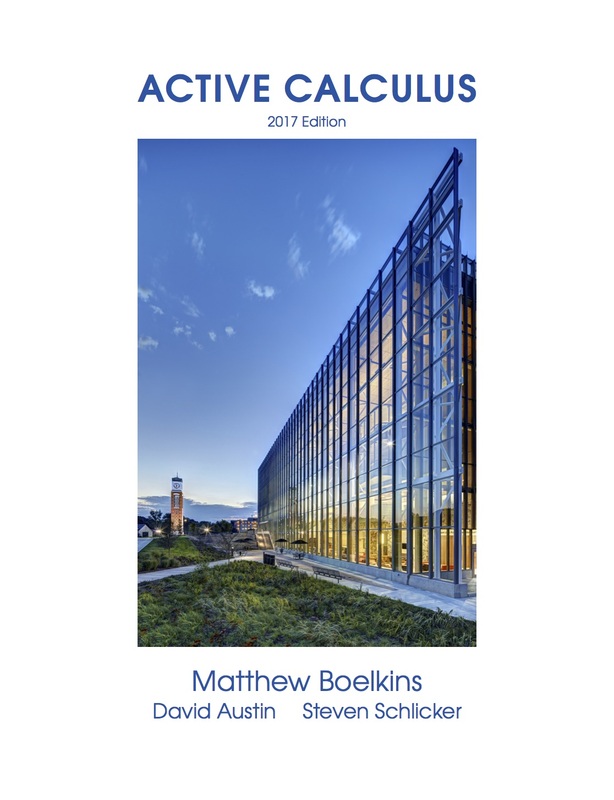 Active Calculus - single variable is a free, open-source calculus text that is designed to support an active learning approach in the standard first two semesters of calculus, including approximately 200 activities and 500 exercises. In the HTML version, more than 250 of the exercises are available as interactive WeBWorK exercises; students will love that the online version even looks great on a smart phone. The 2018 print version will soon be available for purchase on Amazon for less than $21. Print versions are in black and white to keep costs low; the electronic versions are full-color. Through direct request to the author by email (boelkinm at gvsu dot edu), a range of ancillary materials are available to faculty, including WeBWorK .def files, activities workbooks (.pdf files that include only the activities along with room for students to write), computer laboratory exercises for chapters 1-4 that use Geogebra, and daily prep assignments to support students reading the text. Both the 2018 HTML and PDF versions include answers to activities and exercises in appendices in the back. Each section of the text has at least 3 in-class activities to engage students in active learning. The section on the tangent line approximation is representative of the organization and style of other sections in the text: a brief introduction together with a preview activity, followed by a mix of exposition and several more activities. Each section concludes with a short summary and exercises; the non-WeBWorK exercises are typically involved and challenging. More information on our goals and the structure of the text can be found in the preface. Active Calculus - single variable has been publicly available since August 2012. The PDF version has been downloaded over 80,000 times since August 2014. The author maintains an email list of interested users and communicates a few times a year with updates to the community. Carroll College (Helena, MT) was an early adopter of the text and their faculty have made some useful additions including a Chapter 0 precalculus review, clicker questions for the entire text, and a couple of additional sections on modeling with difference equations. 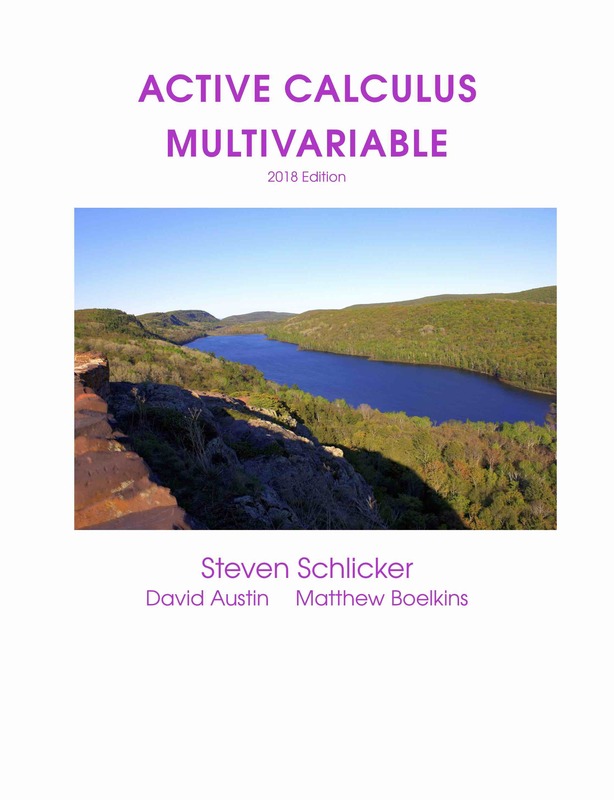 Active Calculus - multivariable has been publicly available since August 2015, under the lead authorship of Steve Schlicker. The multivariable text is similar in style and organization, and is now available in HTML format. Users with questions should contact the author at schlicks at gvsu dot edu. While minor errors in HTML versions may be reconciled as we become aware of them, the PDF and print versions of each text will be updated at most once annually. An archive of earlier versions may be found at the bottom of this page. The texts are available in an HTML version thanks to Rob Beezer's PreTeXt (formerly known as Mathbook XML). To learn more about this project, recent updates, and features of the most recent version, please visit the author's blog or home page. Questions and comments are always welcome directly at boelkinm at gvsu dot edu. The archive of earlier versions follows.